We want to help you integrate financial education into the work you’re already doing. We’re prepared to support your financial education efforts through direct service and staff training. Each workshop can be customized to best fit your class schedule and the interests of your students. In a one hour session, we can typically cover two topics in general or one topic in-depth. We can even help you create a survey to gauge your students’ interests and educational needs. 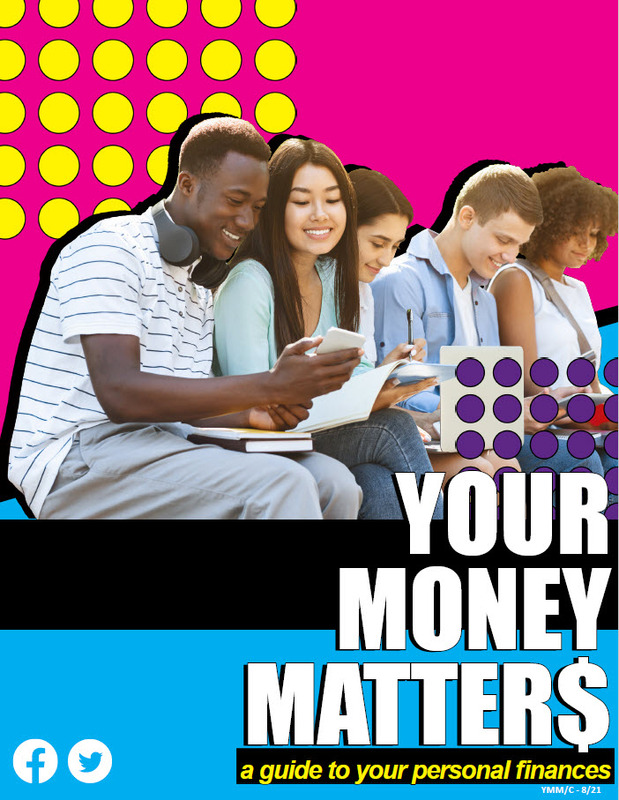 Your Money Matters Guide — College Edition is a 20-page color booklet that highlights a variety of money management topics in a fun, informative way that’s relevant to college students. Your Money Matters Guide — Workplace Edition is a 24-page color booklet that helps adults learn to manage their finances and build wealth. This guide is ideal for wage-earning adult learners and those about to enter the workforce. Your Money Matters — Low-Resourced Edition is a 16-page guide that highlights practical ways for adults with access to fewer financial resources to handle their money, even if they’ve reached a crisis point. Self-paced learning modules help users navigate important financial decisions. Each module contains learning objectives, tools, a quiz and a completion certification. Saving & Banking: exploring how to plan for your future, build wealth and find the financial institution that’s right for you. Auto Loans: looking beyond the monthly payment to get the best car for your needs. Transitioning to Independence: learning to successfully navigate your financial life after college. Money Talks podcasts are on-the-go resources. Each session is three to five minutes in length and covers topics like financial aid, identity theft prevention, savvy savings strategies and understanding your credit score. We recognize that campus professionals and professors have a lot of important information to share with new students during orientation and first-year experience classes, but it’s also one of the best times to introduce them to financial concepts. Let us work with you to customize an approach that works for your students, helping them to avoid financial missteps that can negatively impact their college career and beyond. Take advantage of our workshops, train-the-trainer sessions or orientation materials. Contact us in any time to save a spot on our schedule. We’d love to work with your school! Partner with us to turn your existing events and programs into a campuswide financial literacy initiative. We can help you gather the important players and execute a strategic plan to integrate financial literacy into many aspects of campus life. We’ll help you brainstorm ways to turn existing efforts into a cohesive program. In addition to brainstorming, we can work with your team to develop a marketing campaign and assessment strategy. Financial Friday is a monthly service allowing people to anonymously ask money-related questions and get the answers they need. The last Friday of each month, we send subscribers an email answering a user-submitted question. You can participate in Financial Friday by signing up to receive and distribute the email to your students or staff. For a more customized experience, we can help you develop website text or an online button to promote the service to your students. To learn more about this program and view sample emails, contact us at OklahomaMoneyMatters@ocap.org. We can offer customized financial content for your website, blog, or newsletter and provide a set of key personal finance messages designed for your social media outlets. If you need text that makes an impact, we can help you develop the right material for your audience. We can even help you work with your media personnel or webmaster to distribute the content.